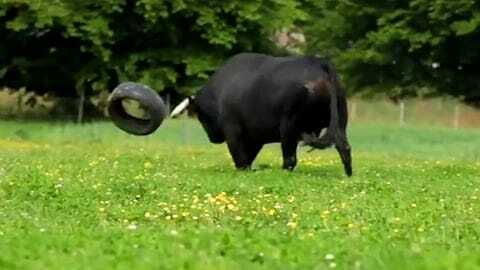 Watch Fadjen, the bull who became a powerful symbol in the fight against bullfighting, as he runs and plays in the open fields. His rescuer, caretaker and best friend, Christophe Thomas, brought him a wheel to play with, and Fadjen just loved it! Bulls and cows are harmless and loving animals when they are allowed to live peacefully in their natural environment. Let's not exploit their gentle character to cause them harm for products we don't need or as a form of amusement. Fadjen is a "fighting bull" who was meant to be stabbed and die in agony inside a Spanish bullfight arena, under the applauds of the public. Fadjen's fate changed the moment Christophe Thomas arrived. The kind man decided to rescue him and bring him to a sanctuary in France. Today, Fadjen is a quiet and sociable bull, living peacefully in an environment that can provide his needs. By breaking biased views set by the bullfighting world, Fadjen has become a symbol of nonviolence and a powerful ambassador in the struggle against bullfighting.